There is a common misconception when it comes to the lines of the MACD. The two lines that are drawn are NOT moving averages of the price. Instead, they are the moving averages of the DIFFERENCE between two moving averages. In our example above, the faster moving average is the moving average of the difference between the 12 and 26-period moving averages. The slower moving average plots the average of the previous MACD line. Once again, from our example above, this would be a 9-period moving average. This means that we are taking the average of the last 9 periods of the faster MACD line and plotting it as our slower moving average. This smoothness out the original line even more, which gives us a more accurate line. 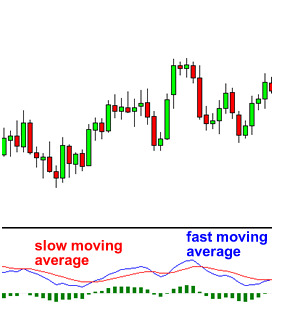 The histogram simply plots the difference between the fast and slow moving average. If you look at our original chart, you can see that, as the two moving averages separate, the histogram gets bigger. 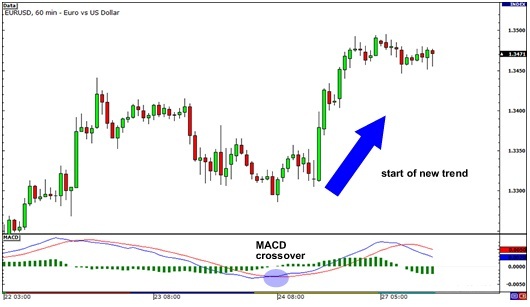 How to Trade Using MACD ? Because there are two moving averages with different “speeds”, the faster one will obviously be quicker to react to price movement than the slower one. When a new trend occurs, the fast line will react first and eventually cross the slower line. When this “crossover” occurs, and the fast line starts to “diverge” or move away from the slower line, it often indicates that a new trend has formed. From the chart above, you can see that the fast line crossed under the slow line and correctly identified a new downtrend. Notice that when the lines crossed, the histogram temporarily disappears. This is because the difference between the lines at the time of the cross is 0. As the downtrend begins and the fast line diverges away from the slow line, the histogram gets bigger, which is good indication of a strong trend. From then, EUR/USD began shooting up as it started a new uptrend. Imagine if you went long after the crossover, you would’ve gained almost 200 PROFITs! There is one drawback to MACD. Naturally, moving averages tend to lag behind price. After all, it’s just an average of historical prices. Since the MACD represents moving averages of other moving averages and is smoothed out by another moving average, you can imagine that there is quite a bit of lag. 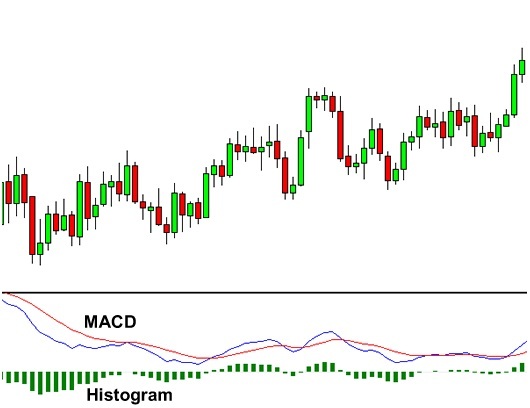 However, MACD is still one of the most favored tools by many traders.